The best app for pic collage, video grid and photo editing! If you are photography fanatic and Instagram lover, you absolutely have to download it! 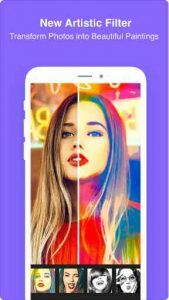 It’s packed with features like Instagram 1:1 & Instagram story 16:9 ratio, Scrapbook, AR face filter, Meme ＆ GIF generator, Slideshow and so much more! Furthermore, we have the most abundant material like stickers, filters, backgrounds & posters! Create and beautify interesting photos & videos within seconds! Edit: Powerful editing tools to help your make stunning creations! Poster: Tons of stylish templates, beautify your creations without editing! Filter: 100+ filters, Greece blue, Paris pink, beautify, black & white etc. Sticker: 500+ stickers, emojis, B-Day, beautify, cuties, you name it! Edit: text, draw, ratio, crop, rotate, beauty, borders, blur, focus, watermark and many other powerful features. We really do have everything. All premium plan will be auto-renewed at the end of each period. Cancellation must be made at least 24 hours before the end of the valid period to avoid a nonrefundable auto-renewal. Cancellation requests made prior to the end of the period will become effective at the end of that period term. You can manage and turn off auto-renewal in your Apple Account Settings. Initiation or termination of a premium plan must be done through the iTunes App Store, which may be subject to a sales tax in your area. Note: you are responsible for checking the Terms of Service of your app store for detail and applicability of sales tax. Cheetah Mobile reserves the right to adjust the pricing for its products and services in the future.